If you don't want to make use of the centipedes and spiders in your house to help keep other insect populations under control, you can either leave the centipedes and spiders alone or find a way to get rid of them. Centipedes and most spiders do not pose dangers to humans, but their presence can fluster homeowners who find their appearance distracting. Insecticides and pesticides can rid a house of spiders and centipedes, but you can achieve the same results without chemicals. Remove spiders and centipedes from your house without resorting to chemicals. Eliminate moisture sources in your home. If you succeed in ridding your home of insects, the centipedes and spiders will not find a food source and will not remain in your house either. Make sure your house does not have any standing water that may attract mosquitoes and other insects. Check to ensure that your pipes and faucets don't have any leaks. Dry out damp areas of your home, such as under sinks, in the basement, in the laundry area and around the bathroom floor. Insects can't survive in a dry atmosphere, and once the insects disappear, the centipedes and spiders will leave as well to find another source of food. Close off any open points where insects can enter, including points where the centipedes and spiders can get in. Make sure all your windows have screens, seal up the cracks in the walls and foundation of the house and caulk any openings around the doors and windows. Make sure that any vents leading to the outside have screens. Scatter eucalyptus leaves around your house to deter spiders from entering. Don't leave open cardboard boxes around as spiders love to crawl into cardboard. Similarly, don't leave wood or leaves to gather against the walls of your house because these niches can provide spiders with a comfortable space to nest. Reduce lighting outside your house as night lights attract spiders. 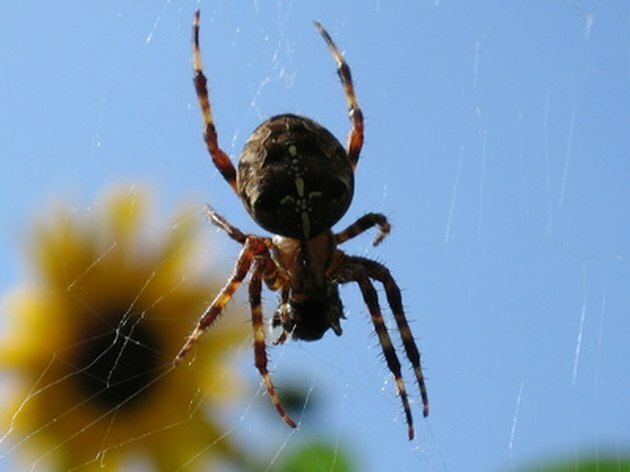 Remove any spider webs as soon as you see them, both inside and outside the house. If you believe that you have a spider infestation in your house, dust and vacuum the house thoroughly and deposit the bag from the vacuum cleaner in a closed plastic bag to seal in any spider eggs that you vacuumed.